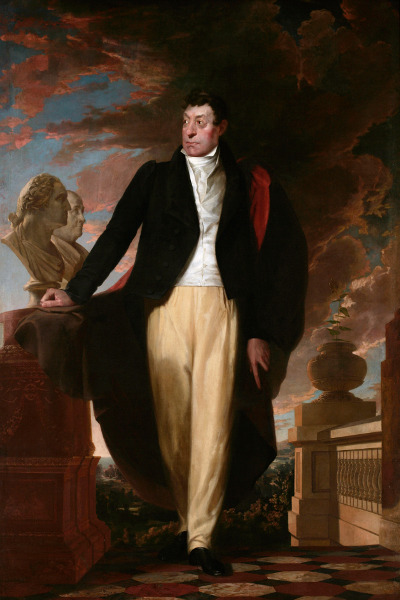 Portrait of Lafayette by Samuel Morse (yes, that one). Recognise the two statues? La Fayette is one of only six people to have been made honorary US citizens, being so-named by US President George W. Bush in 2002. He was sometimes called the hero of two revolutions. As we all know, he first came to the US, during the American Revolution, when he was quite young. But he then came back to France and played a role in the French Revolution, the subsequent chaos, and the years of rebuilding. James Fenimore Cooper, who became friends with him, said of Lafayette: I have often alluded to that beautiful and gentleman-like feature in the character of Lafayette, which appears to render him incapable of entertaining a low prejudice against those to whom he is opposed in politics. This is a trait that I conceive to be inseparable from the lofty feelings which are the attendant of high moral qualities, and it is one that I have, a hundred times, had occasion to admire in Lafayette. I do not, now, allude to that perfect bon ton, which so admirably regulates all his words and deportment, but to a discriminating judgment that does not allow interest or passion to disarm his sense of right. It certainly is a weakness in him not to distinguish sufficiently between the virtuous and the vicious,—those who are actuated like himself by philanthropy and a desire to do good, and those who seek their own personal ends; but this is a sacrifice, perhaps, that all must make who aim at influencing men by the weight of personal popularity. Jefferson has accused Lafayette of a too great desire to live in the esteem of others, and perhaps the accusation is not altogether false; but the peculiar situation in which this extraordinary man has been placed, must be kept in view, while we decide on the merits of his system. His principles forbid his having recourse to the agencies usually employed by those who loose sight of the means in the object, and his opponents are the great of the earth. A man who is merely sustained by truth and the purity of his motives, whatever visionaries may say, would be certain to fail. Popularity is indispensable to the success of Lafayette, for thousands now support him, who, in despite of his principles, would become his enemies, were he to fall back sternly on the truth, and turn his back on all whose acts and motives would not, perhaps, stand the test of investigation. The very beings he wished to serve would desert him, were he to let them see he drew a stern but just distinction between the meritorious and the unworthy. Then the power of his adversaries must be remembered. There is nothing generous or noble in the hostility of modern aristocrats, who are mere graspers after gain, the most debasing of all worldly objects, and he who would resist them successfully must win golden opinions of his fellows, or they will prove too much for him. Was Mr. Jefferson himself free from a similar charge? He lived his later years at 8, rue d’Anjou, where he ultimately died. He is buried in the Picpus Cemetery.